The Sure Shot 510 U Just portable unit is ideal for home and school use. 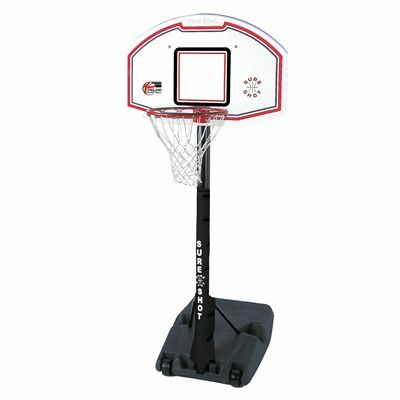 It consists of a durable fan shaped polypropylene backboard measuring 44” (112cm) by 28” (71cm), an 18” steel ring with a net and a heavy duty pole. The unit features two U-shaped bolts that attach the board and the ring to the pole and allow for any height adjustment up to the official 10’ (3.05m). A mobile base of the unit requires 190kg (418lbs) of dry sand or 110 litres (24.2 gal) of water to provide sufficient stability. for submitting product information about Sure Shot 510 U Just Portable We aim to answer all questions within 2-3 days. for submitting product information about Sure Shot 510 U Just Portable. We aim to answer all questions within 2-3 days. If you provided your name and email address, we will email you as soon as the answer is published. Do you sell the pole padding for the sure shot 510? The Sure Shot 510 is sold in two versions- one of which, includes pole padding. This can be found on our website by searching 'Sure Shot 510 U Just Portable with pole padding'. for submitting product review about Sure Shot 510 U Just Portable.